Another day, another character bio trailer for Scourge: Outbreak. This time it is the very Olde English sounding character called Stonewall. You may think that his power is a detailed knowledge of Hadrian's Wall, but you would be wrong. He is in fact a rounded Biotech character that you can use in this 4 player co-op shooter coming soon to PC, PSN and XBLA. Scourge is increasingly looking like a fun alternative to Mass Effect 3's co-op mode. Like Mass Effect, the game is a 3rd person shooter that has players fighting against enemies using a combination of weapons and powers. 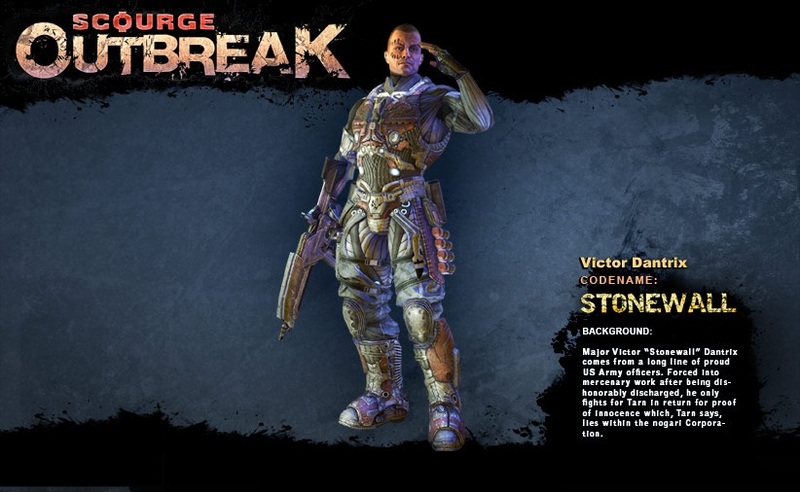 Stonewall may be the most interesting character as be combines Assault Weapon expertise with a couple of mean looking Biotech powers. One is a shield that you and your allies can huddle behind; whilst the other is a powerful melee attack should your foes get too close.